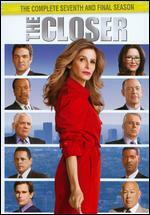 Kyra Sedgwick; J.K. Simmons; Jon Tenney; Corey Reynolds; Robert Gossett. Very Good. In very good packaging. Run time: 60 mins. Language: English. The closer-The Complete Third season. Fair. The case shows some wear and tear. The DVD has the original artwork included. The DVD is in very good condition and shows almost no signs of wear. The DVD shows some wear from normal use. All items ship Monday-Friday-Fast Shipping. Kyra Sedgwick. Good. 2008 Run time: 685. Connecting viewers with great movies since 1972. All used discs are inspected and guaranteed. Used discs may not include digital copies. Customer service is our top priority!